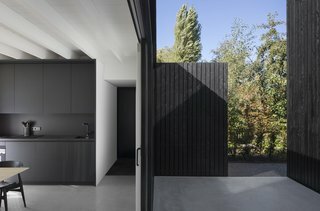 i29 interior architects and architect Chris Collaris designed this minimal, compact home set on an island near the beautiful Lakes of Vinkeveen in the Dutch province of Utrecht. From the exterior, the home comprises small, sculptural pieces that look different from every angle. On the interior, smart interventions maximize space and functionality in a small footprint. 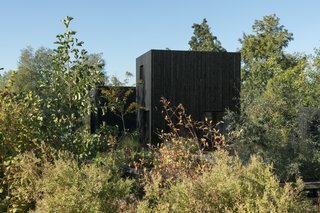 The simple, timber-clad masses of Tiny Holiday Home delicately settle into the surrounding foliage. Set on an elongated island, the holiday home embraces the waterfront setting. 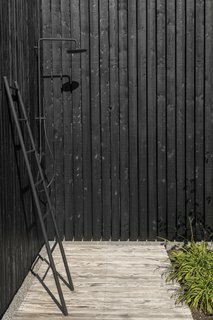 A simple boardwalk leads up to the timber-clad volume, which appears as a sculptural, black box upon entry. Oriented to maximize views and daylight, this eco-friendly home takes advantage of the lakeside setting and embraces the natural surroundings. All volumes have large windows or sliding doors which can be fully opened to blend with the outdoors. Panoramic sight lines provide a continual, visual connection to the surrounding vistas. 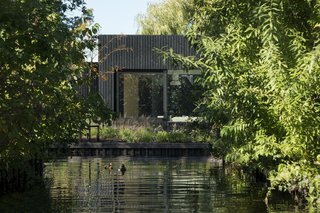 From a different perspective, the home appears more transparent and open to the water. 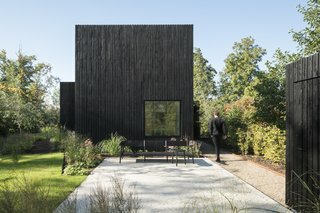 Large openings provide visual and physical connections to the natural setting. The outdoors are part of the cohesive design, embracing the vegetation, sites, and sunlight. 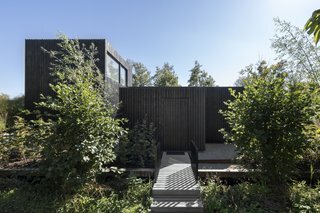 With a footprint of only 55 square meters (592 square feet), Tiny Holiday Home comes together as a single, sculptural composition that is unified and pure. Large sliding glass doors open the living room up to the outdoors, blurring the boundary between inside and outside. 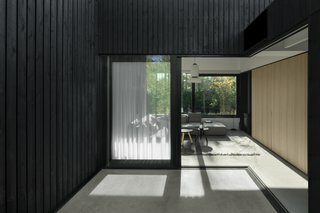 The darkly stained exterior contrasts with the white, light-filled interiors. Large sliding glass doors extend to the kitchen and dining area, creating outdoor cooking space when fully open. An open-air shower is the perfect wash station after outdoor recreation at the lake. The compact footprint of the Salt Chair makes it a smart choice for cafés or just about anywhere you need to maximize seating. Unlike chairs that have widely splayed legs, a Salt Chair can be placed side by side with another without wasting space in between. 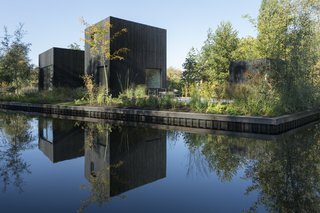 A stunning exploration of the beauty and drama of 150 black structures built by the world's leading architects over 1,000 years. 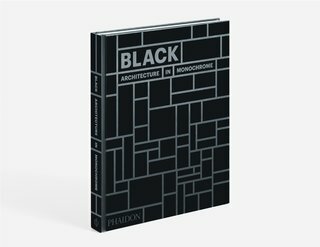 A visually rich book, Black: Architecture in Monochrome casts a new eye on the beauty - and the drama - of black in the built world. 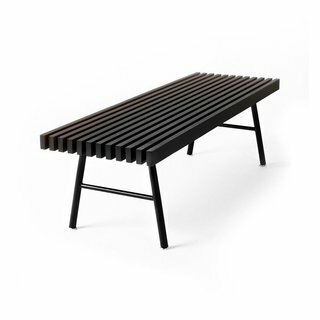 The Gus Modern Transit Bench is a versatile piece that can be used for seating in spaces large or small, or even as a coffee table. 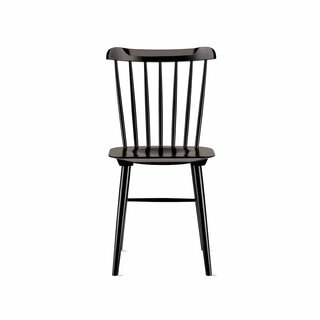 Its top is made of solid ash wood slats that are joined precisely in parallel, creating a look that's pleasingly proportional, lightweight and sturdy. 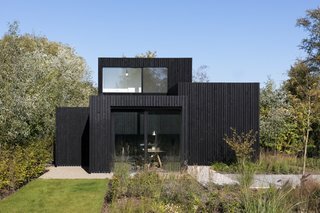 Rough, darkly stained pinewood wraps the exterior, punctured by large windows with concealed frames. 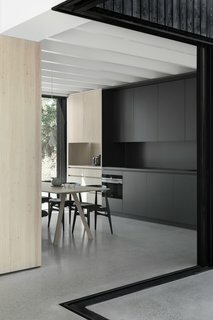 Oak woodwork, concrete floors, and white walls extend the minimalist palette inward. With grand openings to the outside, brightly lit interiors spill outwards, embracing the land. 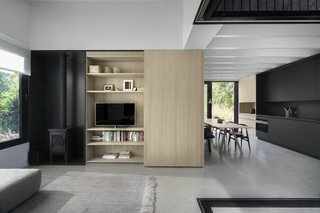 Beautifully detailed built-ins store home necessities. A wood-burning fireplace adds a rustic feel to this modern cabin. 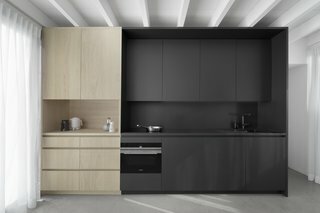 Natural and black painted oak cabinets provide plentiful storage in the galley kitchen. 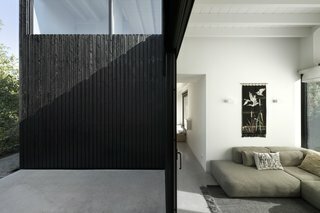 Concrete floors pass from interior to exterior, further emphasizing the connection between the two. 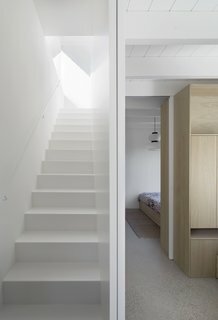 White walls and ceilings allow daylight to bounce and filter through the interior spaces. Oak built-ins provide functional storage and separation between the adjoined bedrooms on the main floor. A large pocket door combines or separates the two sleeping quarters. 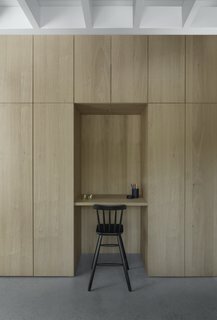 A recess in the floor-to-ceiling cabinetry provides a small working space. 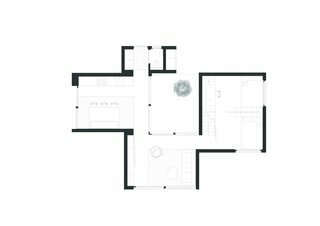 The smart floor plan makes the most of every square foot. 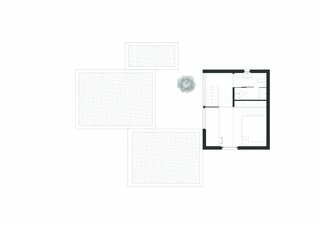 A living room, kitchen/dining room, patio, three bedrooms, one bathroom, and two toilets graciously fit within the home. Ceiling heights articulate the separation of private and public spaces. 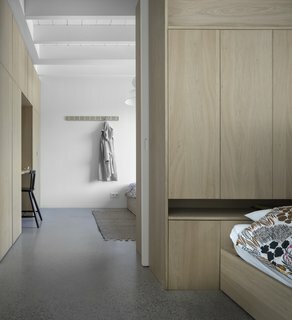 Custom furniture and built-ins further emphasize the sculptural, art-like quality of this simple, holiday home. Structural Engineer: Vissers & Vissters B.V.